If you’re after the feel-good factor of brewing consistently tasty, jungle-fresh coffee, but with absolutely minimal effort a pod coffee appliance has long been the most stress-free solution. Nespresso always used to have a bit of a problem compared to rivals such as Lavazza, however: its pods are just too damn small. 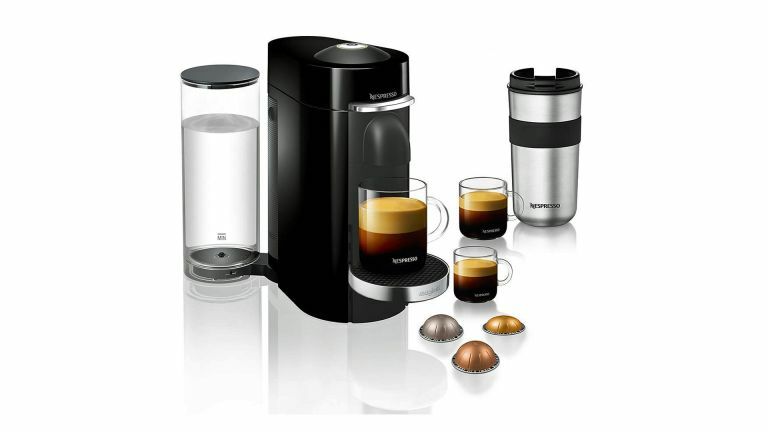 However the bigger, better Nespresso Vertuo system changes all that, and it should definitely be on your radar. As usual with Nespresso there are several very similar machines on offer from different brands but this Magimix one in piano black – the blackest of all blacks, as you know – looks suitably sultry, and serves up sublime coffee in no time. Using pods may not be quite as satisfying as taking the freshly-ground beans route, but it's a great alternative if you’re short on time. With these larger Vertuo pods, you can make drinks from a single espresso shot to a steaming mugful. As noted, the key to its coffee brewing potential is Nespresso's 'Centrifusion' technology. In a Vertuo coffee machine, the pod you’ve chosen is whipped into a frenzy, spinning at up to 7,000 revs per minute. The resulting coffee and water combination is sublime. The Vertuo tailors this process and the size of the drink thanks to a smart barcode-reading system. As you'd expect, there's a huge range of pod options, with Nespresso offering up something for everyone, from the mug-sized likes of Stormio and Intenso down to the Double Espresso Scuro for example. There’s a pod for any time of day or mood, and a single espresso can cost as little as 39p. Making your preferred cup of coffee is simplicity itself. There’s a motorised lid on the top of the machine that opens electronically via a button. You then place the barcoded pod inside and the machine figures out from that what size of coffee it needs to make. Being confirmed coffee guzzlers, we love the 414ml Alto option but anyone wanting a quick hit can head for the small but perfectly formed, 40ml Espresso pods. The most important improvement over older Nespresso pods is if you want a stronger drink – a double espresso, a really flavoursome long black – you can now get it from a single Vertuo pod. That isn't possible with smaller pods. On a purely practical note, we love the sizeable (1.6-litre) water container, which means you’re not continually filling it up. The other bonus with the Nespresso Vertuo system is that it’s a doddle to keep clean, with used pods being stored in their own container that needs emptying less frequently than you’d expect. The drip tray can be washed easily. Yes, bigger pods means even more waste than on a standard Nespresso machine. To be fair to Nespresso, it does offer various means of returning pods to them for recycling. Our personal favourite is to fill a bin liner with pods, and carry it into their ridiculously swanky Regent Street store whilst shouting, "Here you go mate, got more pods for yer!" but you might prefer dropping capsules at a branch of Doddle, or even arranging a free collection from your home (if you have 200+ of them). Incidentally, Colonna, T3's favourite Bath-based artisan-style coffee shop, does old-style Nespresso-compatible pods that are actually compostable – hopefully a Vertuo version will follow. And speaking of pods, John Lewis currently has a deal that lets you claim 100 complimentary Vertuo capsules when you buy one of the Magimix or Krups Vertuo or Vertuo Plus machines. That'll give you plenty of time to get to know this awesome little coffee machine.